When I was a very small girl, due to some reason, I used to be plagued by nightmares almost every single night. As a solution to this, my parents told me to keep a rosary (prayer beads) below my pillow before I go to sleep. And surprisingly, after that my nightmares stopped (mostly). And even more strangely, on days when I would forget to place the rosary, I would again have nightmares. The pious might call this a miracle and the sceptical might not even believe me. But logically speaking, I think that by placing the rosary, I simply believed that the nightmares would go away – and therefore stopped dreaming them up. On the days that I missed, my guess is that my sub-conscious mind was still aware of the facts. So this is my earliest memory of me ever praying for anything – although my parents tell me that when we went for the interview during school admissions, I promptly ran up to a statue of Mother Mary and prayed, and that is what convinced the nuns to give me a seat! In any case, I eventually stopped placing the rosary because of laziness and instead resorted to saying a small prayer before going to sleep, which involved, among other important things, that I shouldn’t get a nightmare. Slowly this grew into a habit. Usually, I mumble a sleepy prayer as soon as I wake up, a hurried one as I am leaving the house and a habitual one before I go to sleep. 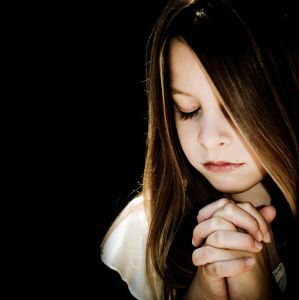 Plus of course, if I need something desperately, on special occasions or I’m either upset or exuberant over something, I do pray. And by praying, I don’t mean that I stand in front of pictures or statues of deities and chant anything. I just close my eyes for a minute and say my prayers, wherever I happen to be. That’s it. I wouldn’t call myself extremely religious. I do believe strongly in my God but for a person who has parents who never ever miss Sunday Mass and in-laws who have a whole legion of impressive churches attributed to them, I lag a lot! For one thing I don’t agree with everything that the Church teaches, including its stand on abortion, contraception and evangelisation. For example, I feel that Christianity is to an extent, if not altogether liberal, towards women. But what is this concept that a woman should cover her head in Church in order to show that she is governed by a man??! I choose to assume that instances such as these are simply miscommunications and distortions that have occurred, over the hundreds of years that this religion has been in existence. Isn't this a lovely prayer? What more could one ask for? It is said to be written by Reinhold Niebuhr in 1943. And the best thing about it is that it is a religion-independent prayer - which means anyone, irrespective of their religious beliefs, can say it when they feel that they need some peace in their lives. This simple prayer is also my wish for this Wednesday's Wishlist. I am impressed with your thoughts on prayer. The one you have quoted is very good. Faith in god is independent of religions...we foolish humans have created mess in the name of god! It is indeed a great prayer and a lovely post. I wish we are more content in life! for a very long time i used to say the "may your will be done ..." prayer. it was so comforting. strangely whenever i visit a church & kneel down to pray i find myself only saying "thank you God" - repeatedly - & my eyes welling up with tears. the tears always always come. don't know why. Yes. Prayers need not necessarily mean standing in front of a statue and praying. Just a sincere soul, praying earnestly for oneself or others. I totally agree with you.And somehow it's become a habit for me, to start and end the day with a small prayer, thanks to my parents and grandparents who instilled this habit in me, I started doing so after watching them chant. I'm sure I wouldn't have uttered another word of prayer if they'd asked me to do it,by force. (lol). And You are so right about the misconceptions. Sometimes it drives me crazy, because they are so silly, some of their ideals and practices. @Chintan: Nice to hear that. Yes What you've said is so true. If only everyone starts thinking like that- we could save so much of unnecessary trouble and loss and strife in this world! @Saru: Thanks! I wish so too-but it is indeed quite difficult! The least we can do is try. @Ash: Great to hear that!If only everyone could be so tolerant, the world would be a much better place. Prayers and belief in God will give us mental strength. The first rosemary beads incident which you mentioned seconds that. The writing also enlightened me on certain nuances of christianity. Thanks Sahana! But its not rosemary beads-its rosary! haha! I can sense the serenity in this post :). Sometimes I wish our Hindu prayers would get translated to an accessible language and format. It often becomes impersonal when we chant Sanskrit words without feeling or connecting with the meaning, and I think that's one of the reasons why many people regard prayers as mere rituals. I've actually come across the words in the prayer you've quoted as part of some saying and it's been one my favorites :). Wise words. Nice post. Well written. Unfortunately some of the leaders of the 'established'religion are very far away from the original living Word.I took like that prayer and always pray for the wisdom to know the difference. Keep blogging!